He says that everyone who enters parliament will be reminded of the values of the constitution. 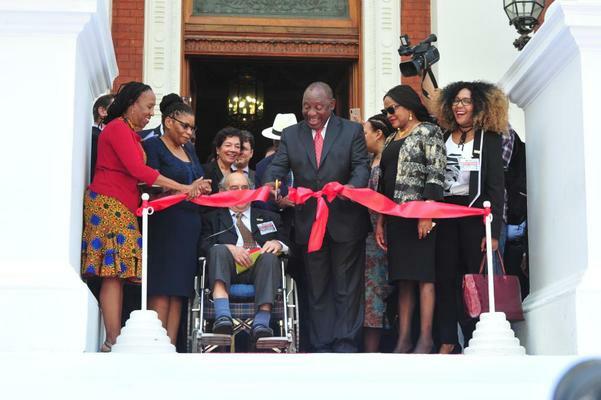 South African President Cyril Ramaphosa on Tuesday unveiled the constitutional inscriptions on the steps of parliament which officially closed the year-long commemoration of the 100-year birthday anniversaries of former president Nelson Mandela and anti-apartheid activist Albertina Sisulu. Delivering his keynote address during the unveiling ceremony in parliament, Ramaphosa said: “I am deeply honoured to be here today to unveil these inscriptions at the steps to the people’s parliament, both here at the National Council of Provinces and outside the National Assembly. The event also recognised the role played by both “giants” of South Africa’s liberation struggle towards the attainment of a democratic South Africa and its constitution. The ceremony took place as the country marked the 25th anniversary of democracy and the end of term of the 5th democratic parliament. “These are the principles for which many in our country fought and for which many lost their lives. The values that underwrite these inscriptions are reflected in the Freedom Charter, adopted in Kliptown in 1955. They are the fundamental values of our democratic society, articulated in our constitution and celebrated every day in millions of different ways,” said Ramaphosa. He said it was important that the unveiling was held in the week that marked Human Rights Day, which is celebrated on March 21.